WASHINGTON (CNN) -- It was a heartwarming sight: Laura Ling and Euna Lee landing on U.S. soil and being reunited with their families. 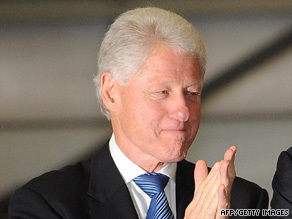 To the elation of their families, Bill Clinton returned to the U.S. with journalists Laura Ling and Euna Lee. Then, after an appropriate amount of time for hugs and kisses, Bill Clinton appeared, descending from his movie-producer friend's plane like an angel from heaven. An emotional Ling practically referred to the former president as a messiah, describing to the media and well-wishers waiting at the airport how she and Lee thought they were being sent to a hard-labor camp, only to walk through a door to find Clinton. The crowd broke into loud applause. For all of those who wondered what Bill would do in Hillary Clinton's diplomatic world, wonder no longer. As details of the Clinton mission came out, it was revealed that the North Koreans themselves asked for Clinton, promising amnesty for the women upon delivery of the former president, whose visit eluded them while he was in office. The deal was done even before Clinton stepped on the plane. So what is next for Bill Clinton? If the mere thought of a meeting with him is enough to move a regime notorious for never moving, can the Obama administration use that star power to rescue three American hikers who ventured into Iran and are believed to be held by Iranian authorities? Can Clinton head off two Russian attack submarines cruising in the Atlantic off the East Coast of the United States? Former presidents are used as envoys and undertake humanitarian missions all the time. Then-President Clinton used former President Jimmy Carter to travel to North Korea in 1994 to negotiate the end to the first nuclear crisis. Clinton and his predecessor, George H.W. Bush, were tapped by Bush's son, then-President George W. Bush, to lead relief efforts to help Asian and African nations devastated by the 2004 tsunami and again in 2005 after Hurricane Katrina. But the relationship between Bill and Hillary Clinton and President Obama is complex, to say the least. After a bitter-fought battle during the Democratic primaries, Hillary Clinton supporters were looking for a robust role for her in exchange for her support of Obama, with many even suggesting her as a possible candidate for vice president. That idea was short-lived. The Obama team wanted Hillary far from the West Wing. And they wanted Bill even farther. When Obama tapped Hillary to be his secretary of state, there was no shortage of critics who asserted that her husband's global foundation and role as a high-paid public speaker would present a conflict of interest. The Clintons agreed to strict rules of the road to avoid such conflicts going forward. However Hillary never demurred in her praise for what her husband has accomplished, both during his eight years in the White House or post-presidency. Hillary herself has said she considered her husband a trusted adviser and could even consider using him where appropriate. He is a former president, after all. Bill Clinton has largely stayed out of the limelight, quietly continuing his globetrotting on behalf of the world's poor and downtrodden. In May, United Nations Secretary General Ban Ki-moon appointed him as the United Nations' special envoy to Haiti in an effort to refocus international attention on the Caribbean country's deep economic problems and environmental decay. But with the success of his North Korean mission so quick and easy, it's conceivable that Bill Clinton could add the role of "diplomatic cleaner" to his resume -- a version of Harvey Keitel's role as Winston Wolfe in the movie "Pulp Fiction" -- a fixer of messy problems, which he solves with a combination of stylish charisma and lucid thinking under pressure. The Obama administration has no shortage of messy foreign policy problems that Hillary Clinton knows could use a Winston Wolfe.